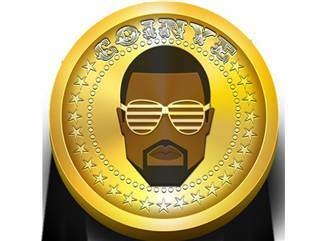 "Coinye West," a new cryptocurrency inspired by rapper Kanye West, will be released on Jan. 11, its creators said. There are plenty of digital currencies out there for those of us fed up with the boring old paper kind bank produced and backed by the government. But what about the oft-neglected overlap between frenzied crypto-anarchists and hip hop fans? Later this month, that gaping hole in e-commerce may finally be filled by "Coinye West," a newly minted cryptocurrency inspired by professional rapper and supreme egoist Kanye West. Much like Dogecoin, the cryptocurrency inspired by the bug-eyed Shiba Inu Internet meme, Coinye is based on the virtual currency Bitcoin. Coinye's anonymous creators began promoting the currency late in 2013, even reaching out to Yeezus himself on Twitter on New Year's Eve to try to pique the musician's interest. West, who has no connection to the project, has yet to make any public statement. Who the creators (or just creator) are, meanwhile, remains something of a mystery. They were not immediately available for comment on this story, though they told Noisey, Vice's music blog, that they were determined to maintain anonymity going forward "in case Kanye gets pissed off." The motivation behind creating Coinye, they told Noisy, is to create a "cryptocurrency for the masses." In other words, they wanted to set up a more user-friendly version of Bitcoin with a relatable face on it to help users, say, "buy concert tickets, with cryptographically verified virtual tickets." Seeing as the source code for Bitcoin is publicly available, we can probably expect a lot more cryptocurrencies like Coinye or Dogecoin to proliferate throughout 2014. Heck, if Coinye really takes off, celebrities like Kanye will undoubtedly want to get in on the ground floor of minting their own currency. But how many, if any, will emerge from the fray as legitimate competitors to Bitcoin versus those that will undoubtedly remain as one-off spoofs? The creators of Coinye made sure to emphasize on Twitter that this is not a joke. The new Kanye-themed currency will launch officially on January 11, the creators said, so now is probably a good time for early adopters to start saving up. Yannick LeJacq is a contributing writer for NBC News who has also covered technology and games for Kill Screen, The Wall Street Journal and The Atlantic. You can follow him on Twitter at @YannickLeJacq and reach him by email at: Yannick.LeJacq@nbcuni.com.